Use safety latches and locks for cabinets and drawers in kitchens, bathrooms and other areas to help prevent poisonings and other injuries. Keep dangerous items such as medicines, household cleaners, lighters, knives etc. locked up. Even things with “child resistant” packaging should be kept in areas that children cannot access. Child resistant does not mean child proof. Safety gates can be used to prevent falls down stairs and to keep children out of areas with possible dangers. When installing a gate at the top of stairs, make sure that it is bolted to the wall. Make sure you purchase gates that meet safety standards. To avoid burns, install Anti-Scald Devices on your showers and faucet heads. Make sure you have smoke alarms on every level of your home. It’s important to check them frequently to be sure they are working properly. Change the batteries at least once a year. Many people change the batteries twice a year when the time changes in the fall and spring. Carbon monoxide alarms should be used in your home as well. Corner and edge bumpers on tables and fireplace hearths will help prevent injuries if a child falls against them. Children are very curious and it would be no surprise to find them trying to stick things into plug outlets. Prevent electrical shock by placing outlet covers in outlets that you use. Make sure they fit snugly and are not easy for a child to remove. They should also be large enough that they won’t be a choking hazard should a child get one out. If there is an outlet that you know you won’t be using, covert it with an outlet plate. Large pieces of furniture and appliances can tip over and crush a child. Make them secure by anchoring them to the floor and/or attaching them to the wall. If you have a pool or spa, it is vital that you have it surrounded by a fence that is at least 4 feet tall and includes a self-closing, self-latching gate. Doors that lead out to the pool or spa should have alarms on them to indicate if someone has opened them. A pool alarm adds another layer of protection. Be aware of poisoning risks. You might not realize this, but many plants commonly used as decorations during the holidays are considered poisonous and should be kept out of reach of children. These include: mistletoe, holly, poinsettias, and Jerusalem cherry plants. Symptoms of plant poisoning can include rashes, nausea, vomiting, and diarrhea. If you ever think your child has ingested part of a plant, immediately call your pediatrician or the American Association of Poison Control Centers at 1-800-222-1222. Choking and swallowing of small items is something you must be extra careful to prevent during the holidays. Young children are attracted to all things bright and shiny…and this time of year there is a lot of bright and shiny! 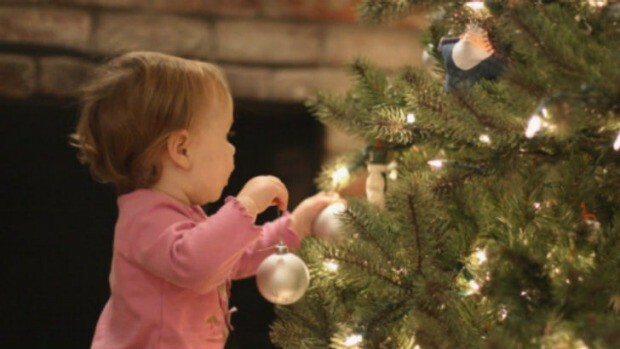 Things like tree ornaments, ornament hooks, light bulbs, tinsel and small toys are all potential choking hazards for small children because they may block the airway. If something is small enough to fit in a young child’s mouth, chances are it will find its way in! So keep small items out of reach and watch little ones carefully! Make sure your Christmas tree is very secure in its stand and can’t be pulled over easily. The last thing you want to find is your little one trapped under a fallen tree. And trust me, they will pull at it if given the opportunity. Kitchen accidents increase during the holiday season. Many people spend a lot of extra time in the kitchen preparing special meals and baking sweets to share. Young children want to help…and they should. It can be a fun experience for the whole family! But be aware of potential hazards that can happen when you’re busy in the kitchen. Again, while childproofing your home will not guarantee safety, it will go a long way toward protecting your children from injuries or worse. The peace of mind you will have knowing you have done everything you can to protect your children will be well worth the effort and time put into making sure your home is as safe as possible.